We have extensive experience in representing plaintiffs from Escondido, San Marcos, Oceanside and across California in serious personal injury caused by bus accidents. 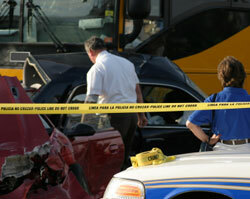 We have handled many bus accident injury cases to successful conclusion. If you have suffered serious injury or lost a loved one as a result of a bus accident, please contact the Rubinstein Law Group for a bus accident lawyer in San Marcos to evaluate your case. Bus accidents can result in serious personal injuries or death and may be caused by a driver’s negligence, failure to drive appropriately for conditions, defective vehicles, improper maintenance, inadequate security, or dangerous roadways. If you have been injured or lost a loved one in a bus accident, whether you were a passenger, a pedestrian, or a driver or passenger of another vehicle, you may have a claim for your personal injuries. Please immediately contact our Carlsbad bus accident lawyers, as we have extensive experience in representing bus accident victims. Our car accident lawyer in Escondido has handled claims against both public and private bus companies that owe you – the consumer – the highest duty of care as a common carrier. Claims for damages against bus companies are often more complex because many bus companies are public entities. This means that there may be strict time limitations and other specific regulations on how and when claims may be made. These laws are complex and you need the expertise of a bus accident lawyer in Escondido that has made many public entity claims against bus companies, such as the personal injury attorneys in Carlsbad at the Rubinstein Law Group. All bus accident injury cases are handled on a contingency fee. A contingency fee means that if we don’t get compensation for you there will be no fee. If you have been in a bus accident, please contact our Escondido personal injury lawyer immediately at (760) 804-2790. Please contact the Rubinstein Law Group today to schedule your free consultation with our bus accident lawyer in San Marcos. Mr. Rubinstein serves clients in San Marcos, Carlsbad, Oceanside, Vista, and Escondido, California. Call (760) 804-2790. 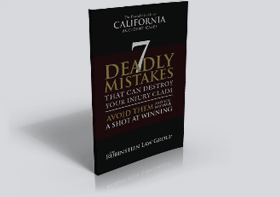 We can come to you if you need a bus accident attorney in San Diego or Southern California.